This is the perfect tour for a special cultural experience with a Costa Rican family and a great opportunity to get up close with nature! Your private nature sanctuary expedition starts with a beautiful drive up to the northern plains, through rural and exotic Costa Rica. At the end of the road you’ll arrive at the very rustic home of Don Abelino and Doña Wendy. Their house sits on 50 acres of private and mostly untouched land. Enjoy a short break for refreshments and to meet your hosts before the adventure begins. On this river expedition through the wildlife sanctuary, you will have close encounters with native fauna on an expertly guided adventure. You will board a small and noiseless motorboat specially designed to navigate the untamed channels of the river without disturbing the wildlife. The river is part of a complex ecosystem of wetlands that irrigates the vast plains and evergreen forests. These wetlands are an important and key nesting area for several species of migratory and nonmigratory birds. 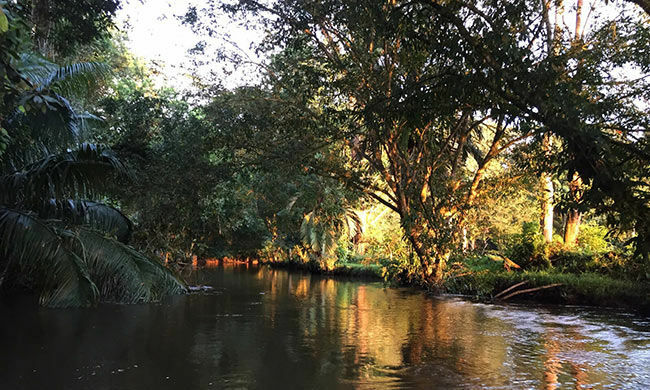 As you float down the river, you’ll arrive at Caño Blanco lagoon, one of Costa Rica’s last great wild places, where its peacefulness and beauty will astound you. Your bilingual guide will point out and explain about the animals you’ll see along the way. Because there is almost no traffic on this private stretch of river and animals are not disturbed, it is practically guaranteed to spot many different species such as sloths, bats, howler monkeys, spider monkeys, and the white-faced capuchins. You’ll also see reptiles such the Jesus-Christ Lizard, iguanas, turtles, caimans, and maybe even crocodiles. It’s a birdwatcher’s dream, too, with such a vast assortment of aquatic and non-aquatic birds such as herons, storks, kingfishers, Jacanas, ducks, trogons, potoos, ospreys, hawks, and more. After about two hours on the river, you will return to your host’s house for a delicious traditional lunch. You’ll try their homegrown and homemade food cooked over a wood stove and, with the help of your guide, practice some Spanish with them. After your meal you’ll get some hands-on experience as you help make a traditional dessert to enjoy. On the way back to the hotel, you will have an optional short stop at a shop where the Maleku indigenous tribe will give a short presentation about their culture, language, and traditions. Souvenirs are available for purchase at the store. This tour is not physically challenging and is appropriate for everyone. Note: Each child under 12 must be accompanied by an adult. Included: bilingual naturalist guide, 4×4 transportation, beverages and snacks, boat ride, safety equipment, poncho, traditional lunch, visit to indigenous tribe. What to bring: light, comfortable clothing, sandals or tennis shoes, binoculars, camera, sunscreen, insect repellent.